Walking with Jesus: Day 54: Acts 16:11-15 & Prov. 19:23-29 - Should Christians Strive to be Strategically Minded? Day 54: Acts 16:11-15 & Prov. 19:23-29 - Should Christians Strive to be Strategically Minded? Should Christians Strive to be Strategically Minded? When Christians engage in missions, it is critically important that we be strategic and wise. but also that we be prayerful and bold. Sometimes people set these mindsets against each other, some people preferring to be cautious and thoughtful, while others prefer to be bold and courageous, stepping out in faith and taking risks for the Gospel. Which mindset is correct? Instead of setting them opposite each other, we need to see how necessary it is for us to take both approaches at the same time. 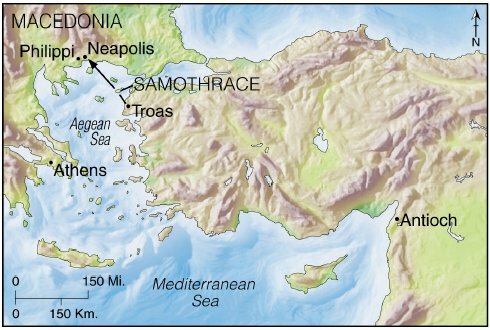 Today, we see one of the great moments in missionary history, as a group of missionaries - including Paul, Silas, Timothy and Luke - sailed from Troas to Samothrace and then on to Neapolis. 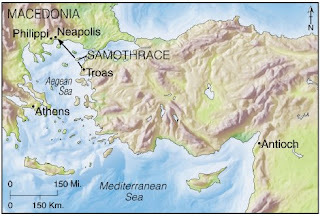 It was a short sail from Asia Minor to an island in the Aegean and then to Macedonia, and with it, the Gospel crossed from Asia to Europe. The four men in this missionary band would be involved in writing 15 of the 26 books of the New Testament. They were moving from an area of the world that was very familiar to Paul into uncharted territory. The missionaries had made this journey in response to God's call, which came in the vision of the Macedonian man (vv. 9-10). They were stepping out in faith, taking a risk, moving from the known to the unknown. Yet they would be wise and strategic about their new endeavor. Paul was a Jewish scholar from Tarsus, a city in Asia Minor, The bulk of his missionary experience at this point had centered around entering cities in Asia Minor and going to the synagogues to speak to Jews. Now they were in Macedonia, so what would they do? They headed for Philippi, the key Roman city in the region. Once they arrived, they took several days to orient themselves to the city, to survey the situation. They were likely looking for a group of Jews, so they could begin by presenting the Gospel to them. They found a place outside the city gates by the river, which they thought was likely a place of prayer. On the Sabbath, a group of women came down to the river to pray. The missionaries presented the Gospel to these women, who listened respectfully. One of the women who listened most eagerly and responded most readily was Lydia, a seller of purple cloth. She was from Thyatira, a city in Asia Minor. Two things are interesting about this fact: Paul himself was a Jew from Asia Minor, and God had just directed the apostles away from Asia Minor, and now their first convert was from the area God had closed to them. After Lydia was baptized (along with her whole household, as was the standard practice), she became the key contact and her house became a center for operations in Philippi. As a merchant, Lydia would have had good contacts and a good reputation within the city. God honors faith and prayerful risk-taking and also wise planning and strategic thinking. Both are vital for effective ministry. May the Lord be pleased to grant us both faith and wisdom, both boldness and strategic thinking. Heavenly Father, Thank You for the precious gift of the Gospel and the call You have given all of Your people to take Your Gospel to the nations. Give us faith to trust You and be willing to take risks to advance the Gospel. Give us also wisdom and discernment, that we may be strategic in our approach to missions, that we may serve Your kingdom effectively. In Jesus' name, Amen. as as walk in fear of You, freeing us from fearing anyone of anything else. and yet we are continually tempted by the world to reject Your wisdom. and from hating and degrading our enemies instead of loving them. and if we embrace the lie of selfishness, we will only harm ourselves in the end. and make us teachable and responsive to Your word and Spirit. May we honor You by never straying from Your words of knowledge.